Your Place for Movie Reviews and monthly review of films coming out each month. Synopsis: T’Challa, after the death of his father, the King of Wakanda, returns home to the isolated, technologically advanced African nation to succeed to the throne and take his rightful place as king. The eighteenth film in the Marvel Cinematic Universe is one fans have been waiting for, and one that fans have been making a good uproar about. For the first time, there is a superhero movie – at least in the modern age of superhero movies – with a predominate black cast, and one that’s actually good and doesn’t rely on stereotypes. While the race element is something someone can talk about more clearly than I can, Black Panther is without a doubt something special and different than we have gotten before. Black Panther starts off with a brief history of how the fictional country of Wakanda and the Black Panther came to be, and from there we jump to a brief scene in 1992 with a young King T’Chaka. 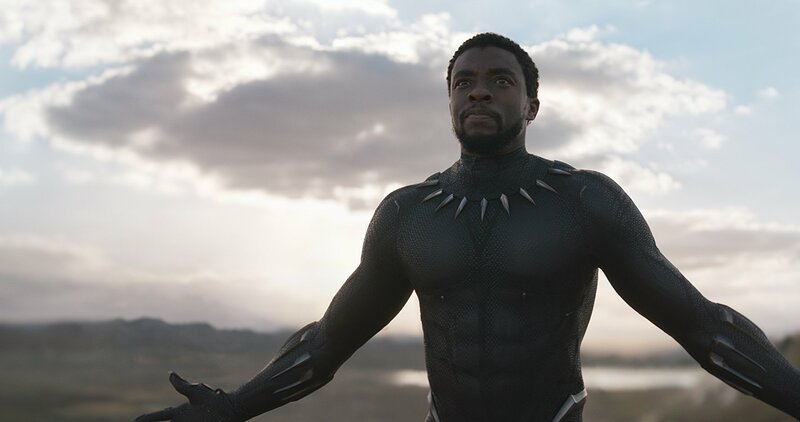 However, we then jump to the present day and see T’Challa (Chadwick Boseman), as he takes the throne in his home country with the people closest to him by his side. His mother Ramonda (Angela Bassett), his youngest sister and head of the science/weapons division Shuri (Letitia Wright), the Dora Milaje general and friend Okoye (Danai Gurira) and his former lover Nakia (Lupita Nyong’o). 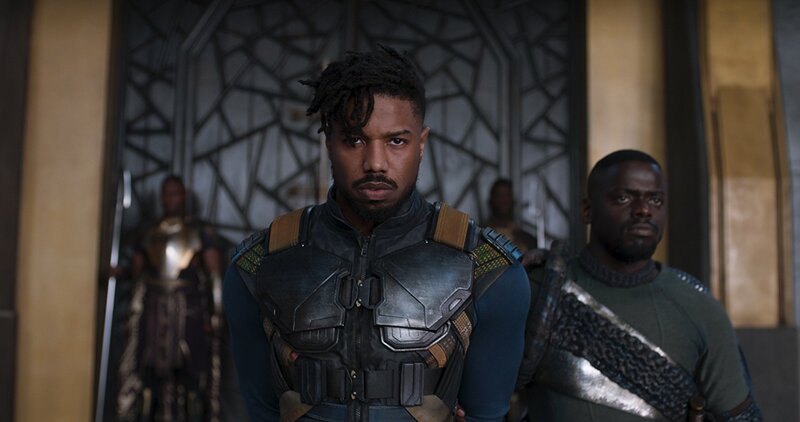 However, T’Challa reign doesn’t go too smoothly as Ulysses Klaue (Andy Serkis) comes back into the picture, along with some help from the mysterious Erik Killmonger (Michael B. Jordan). T’Challa must now decide what kind of king he wants to be, and stop threats from all around him. Like I mentioned, Black Panther is something special and different. The movie doesn’t strive away from touching on the racial issue unlike other Marvel films. They usually touch on them and move on to the bombastic action scenes, which is fine for me, but Black Panther doesn’t shy away from at all. In fact, it doesn’t even try to hide them and hits them all on the head without sounding preachy or forcing it upon us. Everything touched on makes sense, and when you take a step back, you start to realize what the message is coming from a superhero film of all places. There there’s Wakanda itself. The technologically advanced country is a sight to see, with technology that doesn’t yet exist, but also with African tribal touches everywhere you go. Speaking of that, there is a lot of African tribal touches throughout the movie that just make Black Panther more authentic to its roots and gives it the extra touch above other films, especially in the Marvel Cinematic Universe. When it comes to everything else about the movie, well, it’s still pretty damn good. The cast are all fantastic from top to bottom. Of course, we already saw Boseman as T’Challa in Captain America: Civil War, but his character here really gives us a better sense at what to expect of him in the future of the Marvel Cinematic Universe. On the other hand, Michael B. Jordan’s Killmonger is arguably one of Marvel’s best villains to date. He reasoning is sound and most importantly, he’s well-written to the point that I wish there was more of him in the movie. The other men fair well with Martin Freeman returning as Everett Ross in a bigger role than I thought he’d have. Get Out breakout Daniel Kaluuya has a small, but hopefully bigger part in the future, role as W’Kabi, T’Challa’s friend that takes an interesting turn. Andy Serkis’ Klaue returns in a hammed up approach that surprisingly works and is a ton of fun to watch. Finally, Winston Duke, who plays rival M’Baku is definitely one of the breakout stars here acting in a way that you wouldn’t believe he would at times. But let’s talk about the women. 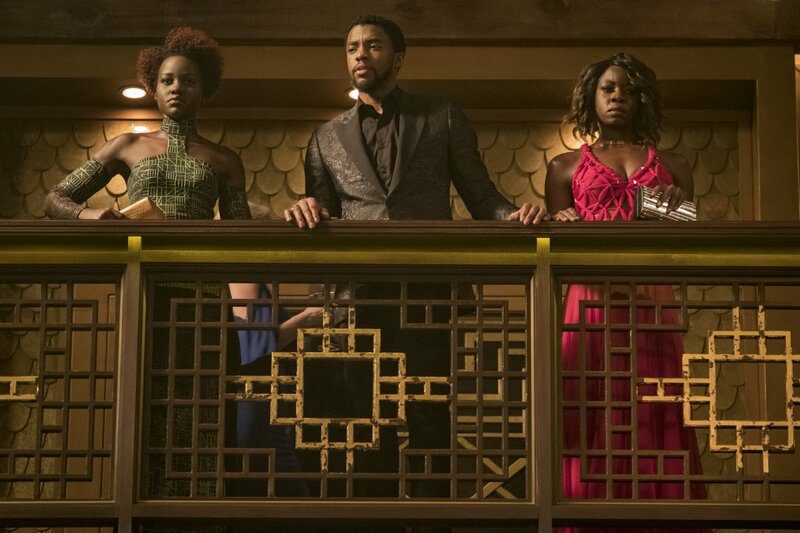 The women in Black Panther are freaking badass! Danai Gurira as Okoye, the general of the Dora Milaje, is a force to be reckoned with anytime there’s a fight. 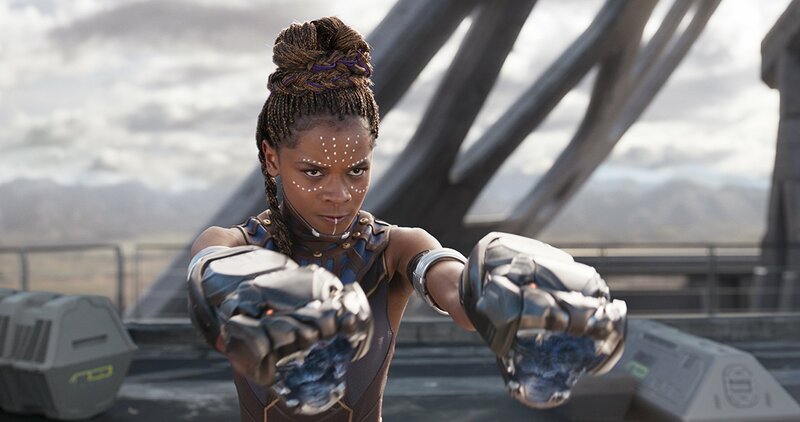 Letitia Wright’s Shuri brings a spark of energy and fun every time she’s onscreen, and Lupita Nyong’o’s Nakia acts like a bit of a moral compass for T’Challa, but also brings up the concept of what would you do for your country versus what should be done. Finally, Angela Bassett just commands the scenes every time she’s on because, well, she’s Angela Bassett. Now, the movie does have a few faults. It does fall into the Marvel final battle cliché of being a bit too CGI-heavy with the final fight between T’Challa and Killmonger. Also, while we get to see Wakanda and its interesting history, along with its traditions, I would have liked to see a little more of the actual city. All in all, Black Panther is an important movie no matter which way you look at it. Not only is it a superhero movie with an all black cast, but one of Marvel’s best films to date. 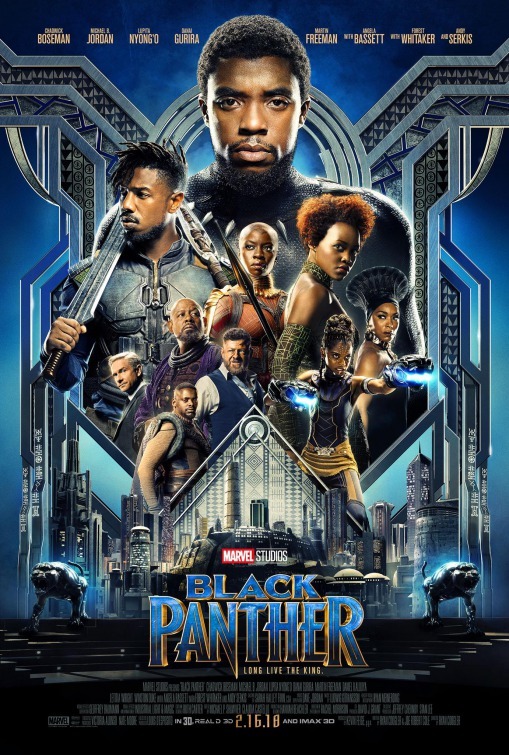 With well written characters, a story that isn’t all over the place, and a deep and personal message and theme, Black Panther is a movie you should go watch as soon as possible. The end of the year doesn’t just mean putting out your best/favorite movies of year. It can be a time to reflect the individuals like directors, actors, actress, supporting roles, villains and everything in between. So, that said, I’m here to do just that. We all have our favorites, and these are mine. This is of course my opinion. I tried to shorten the list as much as I could, but like every year, it was a bit too hard so I left the lists as such. Also, villains are probably considered Supporting Actors/Actress in other lists, but again, to not only make the lists shorter, I want the villains to have their own category, because everyone loves a good villain, right? Finally, everything and everyone will be in alphabetical order. This is also part one of two different lists. Enjoy. Javier Bardem as Him – Mother! Jennifer Lawrence as Mother – Mother! Michelle Pfeiffer as Woman – Mother! Cast: Emily Blunt, Benicio Del Toro, Josh Brolin, Victor Garber, Jon Bernthal, Daniel Kaluuya, Jeffrey Donovan, Raoul Trujillo, Julio Cedillo, Hank Rogerson, Bernardo P. Saracino, Maximillano Hernandez, and Edgar Arreola. Synopsis: An idealistic FBI agent is enlisted by an elected government task force to aid in the escalating war against drugs at the border area between the U.S. and Mexico. 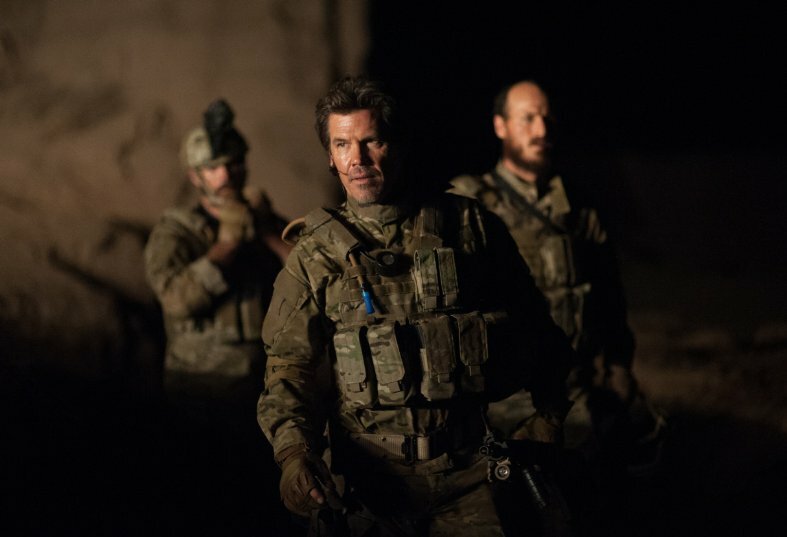 The War on Drugs is something that has been done on film before and some have been done with great success, but director Denis Villeneuve and screenwriter Taylor Sheridan have done something special with Sicario. The film gives an unapologetic, rare and bleak look on the subject and one of the most intense and effective thrillers I’ve seen in a while. 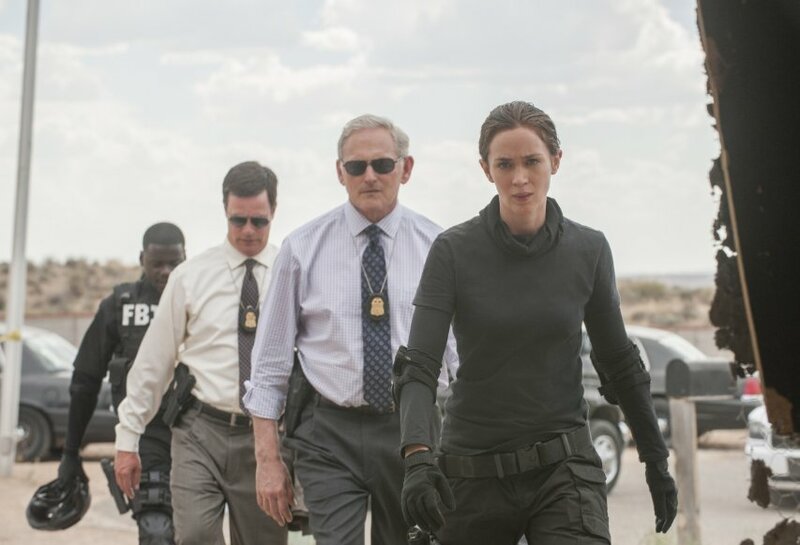 Sicario opens with FBI agent Kate Macer, the leader of a kidnap and response team in Arizona, who with her team that includes her partner Reggie Wayne (Kaluuya) raid a house that has dead bodies inside the walls. The raid and discovery puts her on the radar of government agent Matt Graver (Brolin), who decides to bring her in to his operation of taking down a head of one of the Mexican cartels. When she bought she also meets Alejandro (Del Toro) who, according to Matt, is a “liaison” but never tells her from or what to. As the operation goes on, Kate soon realizes that everything around her may not be as clear cut as it seems. More importantly, can she trust the people around her? Kate acts as our surrogate into the drug war and specific situation they are trying to pull off in the film. Thankfully, Emily Blunt gives another reliable performance and makes us believe her as she is thrown into a world she doesn’t completely understand and well trying to get answers, she is pushed to the side and kept in the dark. Blunt truly is one of the best actresses in Hollywood today and being the lead in the film like this is refreshing to see. They could have easily put a man in the lead role – and they almost did, but Villeneuve and Sheridan protested – but it probably wouldn’t have worked. 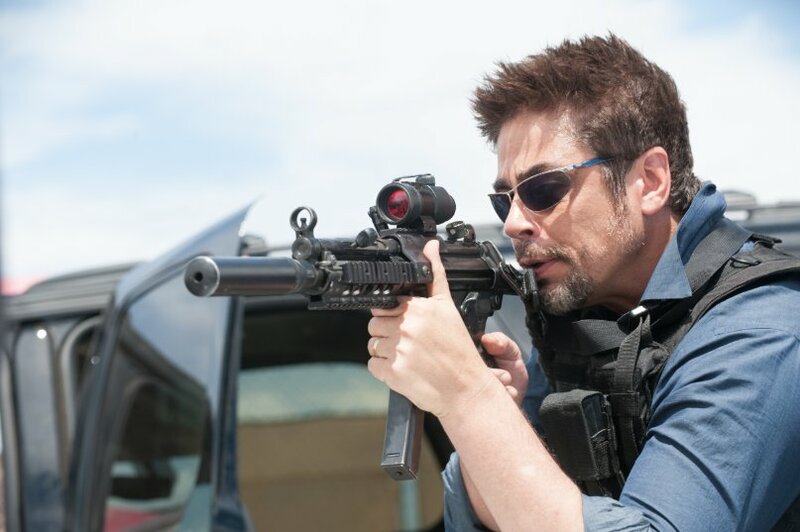 However, despite Blunt’s great performance, Sicario belongs to Benicio Del Toro’s Alejandro. It takes a while to finally figure his character out, but Del Toro gives us enough to be interested in him until that point. Hell, his character doesn’t say too much at the beginning of the film and even other people see him they stiffen up a little bit. Del Toro has always been on people’s radar, but it feels like recently he is getting a lot more attention, and he deserves it. Alejandro is definitely one of Benicio Del Toro’s best characters and maybe one of the best characters of the year. The rest of the cast fare well in the roles they are given, although the film really does belong to the main actors. 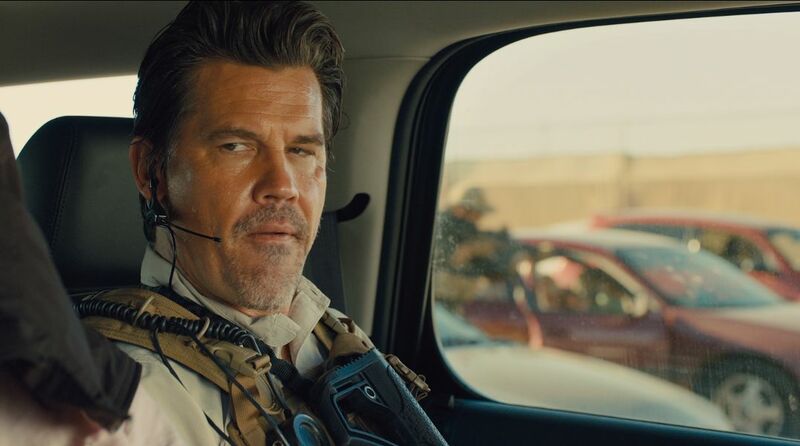 Josh Brolin looks to be having fun chewing up scenery as his cocky, brash and laid-back government agent that is always keeping Kate in the dark right up until the end. Daniel Kaluuya’s Reggie is loyal to Kate through-and-through and has a nice scene that breaks all the tension from the rest of the film that shows you how close the two characters are. Victor Garber pops in as Kate and Reggie’s boss, Jeffery Donovan also pops in as another government agent that Matt works with and is equally mysterious and cocky. Finally Maximiliano Hernandez, who fans will know as Agent Sitwell from the Marvel Cinematic Universe, plays a Mexican police officer, Silvio serves a great purpose to the overall theme of the film than you would think. 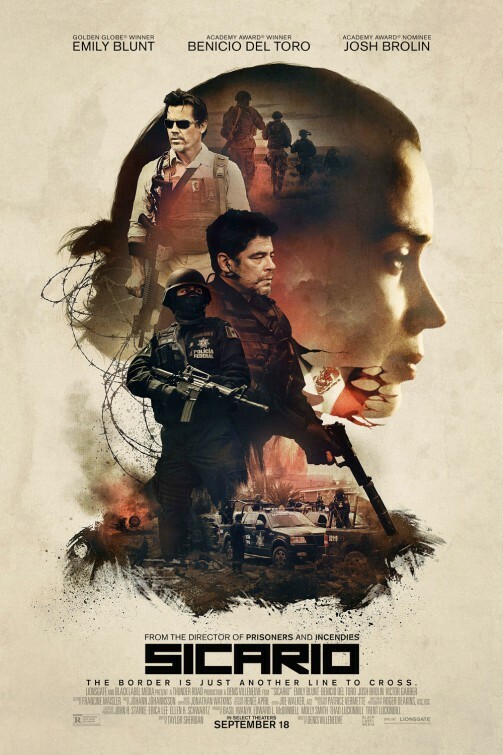 Finally, the last bits that make Sicario all that more effective and great is the chilling and atmospheric score by Johann Johannsson that really elevates a lot of the tension filled scenes. 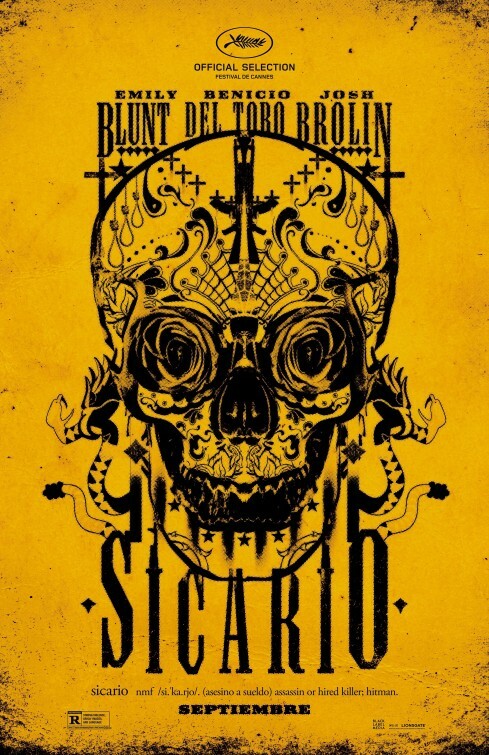 Seriously, Sicario is jam packed with tension from beginning to end, and some nice twists that believe me, the trailers really don’t give away. The other great thing about the film is some of the cinematography by one of the best in the business, Roger Deakins. Some of Deakins shots that are mixed with Johnnsson’s score are just so great by themselves, but mixed with the themes and what leads to them makes the film more worthwhile at the end. 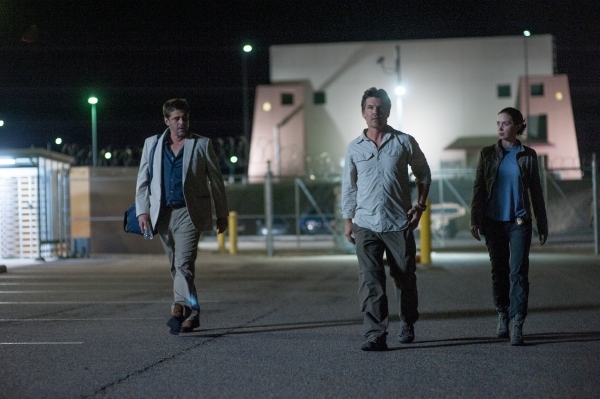 All in all, Sicario is lead by great performances by Emily Blunt, Josh Brolin and more importantly Benicio Del Toro. The film is unapologetic, raw, and bleak, along with being an effective tension filled thriller that I have experienced in years. Will it be for everyone? No, the film is tough and heavy to watch, but layered underneath all that, is a great film.